Dermal fillers are minimally invasive procedures performed to treat volume loss, improve facial contour and fill-in wrinkles. Fillers are most commonly used in the face and specifically around the eyes, forehead and lips and along the jaw. They can also be used to improve the appearance of the hands and neck in order to provide a softer, more youthful look. Fillers are among the most sought after aesthetic treatments because they require very little recovery time and are considered a low risk treatment. Fillers do not require expensive hospital visits since they can be administered at a doctor’s office. 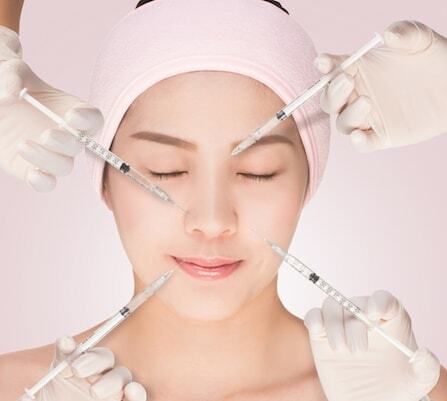 The cosmetic physician will cleanse the treatment area with an antibacterial agent and mark the injection site. Numbing cream can be applied to the area especially if the filler doesn’t already contain a local anesthetic, such as lidocaine, to comfort the injection. Fillers are injected under the skin and only take a few moments per injection site. The amount of filler and depth of the injections depends on the type of filler used as well as the desired results. There are 3 types of fillers and they are temporary, semi-permanent and permanent. It is important to understand the differences and where each of the fillers can safely be used. Collagen-Based Fillers: This was the first type of filler on the market. Collagen is a protein which is naturally found in the body. It is known to add strength and structure to the skin. Some of the common brand names for this filler include Cosmoderm, Cosmoplast and Evolence. Hyaluronic Acid-Based Fillers: This filler quickly became the popular choice when it was introduced into the market. Hyaluronic acid is a natural substance found in the body but this particular substance helps to endorse fullness and volume. Juvederm and Restylane are some of the common brand names for this type of filler. Calcium Hydroxylapatite: This filler is denser than hyaluronic acid and it is injected deeper under the skin. Since this material is commonly found in bones, it generally does not cause immune or allergic reactions. Radiesse is a popular brand name of this filler. In order for a filler to last longer, it is typically a thicker substance. The biodegradable synthetic filler known as poly-L-lactic acid is a type of soft tissue filler used to treat deep facial lines. However, it may be necessary to have an occasional “touch-up” procedure a few weeks after the initial injections. Sculptra and Radiesse are common brands associated with semi-permanent fillers. Permanent fillers are prepared with collagen and polymethylmethacrylate or PMMA. Polymethylmethacrylates are microspheres that are not capable of being absorbed by the body. However, this filler is only used within thick skin regions such as the nasolabial folds. The nasolabial folds are the folds of skin between the cheek and mouth area. This substance is not recommended for other areas such as the lips or around the eyes. BellaFill is a commonly used permanent filler brand. Since fillers are minimally invasive and have little to no downtime, they can be administered the same day as the consultation. Patients may experience some redness, swelling or minimal bruising at the injection site which will dissipate within 7 to 10 days. There are generally no restrictions or pain medications needed and ice can be applied to the treated area to minimize bruising. The lengths of results vary depending on the type of dermal filler used and the area it is used in. Collagen-based fillers provide the shortest benefits because they only last between 2 to 4 months. Hyaluronic acid fillers last from 6 months to a year. Typically, semi-permanent fillers last between 12 and 18 months. Permanent fillers provide the longest benefits and can maintain consistency for 5 years or more.